OTTAWA, ON – Yet another comeback couldn’t win the game for the Ottawa 67’s as they dropped a high-scoring affair to the Erie Otters Thursday night. They trailed 4-1 in the latter half of the second period before storming back to force overtime, before the Otters took away a 5-4 shootout win. 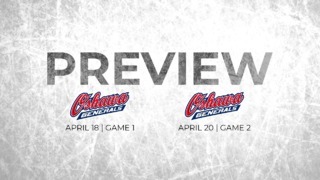 The loss drops the 67’s record to 13-9-1-1 on the season – still placing them second in the east division. The Otters couldn’t have asked for a better start to the game, opening up the scoring in the first period with three straight goals off the sticks of Ivan Lodnia, Taylor Raddysh, and Owen Headrick. The 67’s had an answer though, scoring a couple in the latter half of the game to make things interesting. First, Hudson Wilson notched his first of the season on a pass from Sam Bitten, cutting the Erie lead to 3-1 at 3:32. Headrick had a response moments later, burying his second goal of the game under a minute after Ottawa’s first to restore a three-goal lead for the host Otters. However, a flurry of Ottawa offence brought them back into the game. Quinn Yule started the offence, making it two goals for the 67’s from two players scoring their first of the season. Right off the bat in the third, Tye Felhaber had an unassisted goal to bring Ottawa within one. 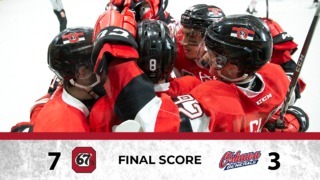 Finally, the 67’s resilience paid off late in the game, as they completed their thrilling comeback in the dying seconds of the game. Noel Hoefenmayer buried the game-tying goal with 14 seconds on the clock, sending the game to overtime tied 4-4. OT solved nothing, and it took five rounds of the shootout before Maxim Golod beat Cedrick Andrée to score the shootout’s only goal. That won the game for the Otters. Despite trailing 3-0, the 67’s outshot Erie 10-8 in the first period of play. 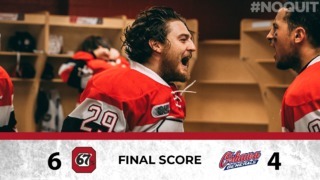 The 67’s would continue that trend in the periods after, outshooting the Otters 36-26 in the game and winning the shot in each period including overtime. It was also a dominant night in the faceoff circle for the Barber Poles – they won 45 of 70 draws on the evening. Both Quin Yule and Hudson Wilson had their first goals of the season – Wilson’s goal was the second in his 99-game OHL career, and the rookie Yule had the first in his career.